Lync 2013 Server integration with Office Web App Server enable users with content sharing features such as Presentations, Whiteboard and Polls. One of the difficulties of troubleshooting those features within a Lync 2013 environment, is that the Office Web App server is an independent server, which does not managed by Lync. The two has many integration points which make if very difficult to determine the root case for a problem involved the two servers. One of the problems I’ve encountered recently, was trying to troubleshoot a problem in which external or federated users were sporadically not able to view any type of content sharing originate by a Lync 2013 user. The problem was only occurring for users connected from the Internet, while internal users were able to share and view content with no issues. Thinking it might be the publishing of the Office Web App Server, we’ve tried access the Office Web App Server external pool name for validation. we added the /hosting/discovery prefix to the address which resulted in a successful reply from the Office Web App Server. 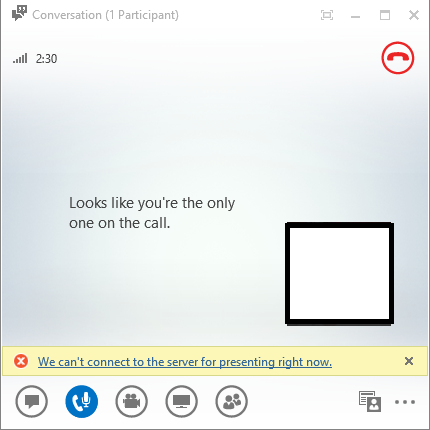 That could explained the reason for the sporadically behavior, it seems to be caused by connection issues between the Lync 2010 Web Conferencing Edge and some of the Lync 2013 Front End’s server. On a regular basis, there should be 4 open connections between an EDGE server and every Front End Server on port 8057. In our environment, we’ve noticed that only 1 out of 3 FE servers had 4 connections opened. the other 2 server had only 1 connection opened. 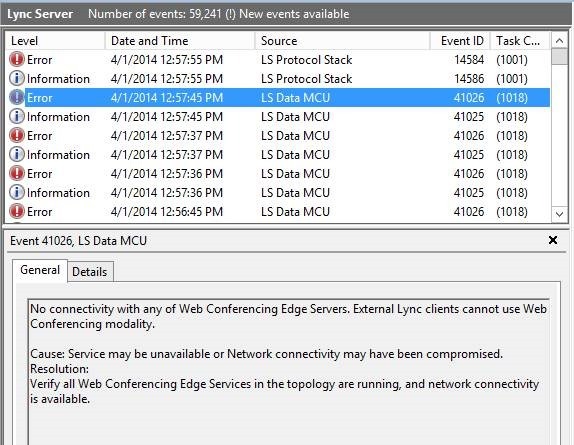 Knowing that there is a problem connecting between the Lync 2010 EDGE servers towards some of the Lync 2013 Front Ends, we’ve decided to run network traces on the EDGE servers in order to determine if there are any kind of drops or negotiation errors. After analyzing the traces, we were able to determine that the problem of the dropped content was due to Certificate Exchange problem. The Lync 2010 Server was having Intermediate and Root CA Certificates which were missing from some the the other Lync 2013 Front End Servers which caused the content part to drop. Once we’ve compared the certificates on all three servers and copied the missing ones, we were able to see 4 connections on port 8057 between the Lync 2010 EDGE server and the Lync 2013 Front Ends and then external/federated users were able to successfully view and share content using the Office Web App Servers.